Big Game James drives past Larry Legend and throws one down in The Chief's grill. Found this KG dunk over Nene when I was looking for Nene dunks. 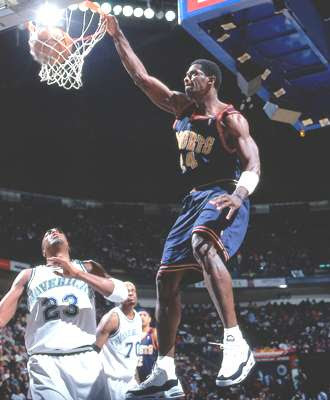 There was once a time when Antonio McDyess was being compared to Shawn Kemp as one of the best big man dunkers in the NBA. This dunk mix captures that time perfectly with some ridiculous McDyess dunks from back in the day. There's some pretty nasty facials after the 2 minute mark. Jermaine O'Neal had a rough night getting dunked on by Greg Oden and then Travis Outlaw threw down this nasty dunk on his dome as well. Hakim Warrick with the high flyin' baseline jam over Rasho Nesterovic. Shaq gives Tim Duncan a stocking stuffer for Christmas. Andrew Bynum with the And-1 dunk on Antoine Walker. Shaq dunks on Gheorghe Muresan not once, not twice, but three times! This is a You Got Dunked On match made in heaven. 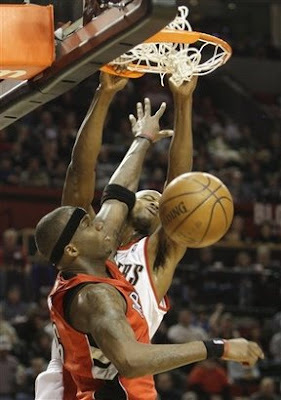 What purpose does Brian Skinner serve in the league besides getting dunked on? There's gotta be someone in the D-League better than Skinner. Ah well, I guess I shouldn't complain because he's been providing a lot of value to You Got Dunked On. Don't mess with UConn's Hasheem Thabeet or he will dunk on your neck. 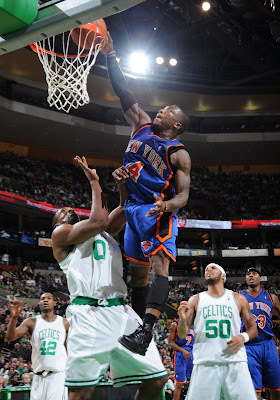 Nate Robinson with the ridiculous putback jam over Leon Powe. There were a ton of nasty dunks this week and I wanna know what the readers think is the Dunk of The Week. Click on the links to view the dunks. but he can still throw down some nasty dunks. now he's plowing through Juan Dixon. I'm convinced that Shaq is going to make sure he dunks on Greg Oden everytime they play. Here's Shaq's dunk on Oden the last time these two faced off.
? I guess Przybilla didn't learn his lesson last time. Get 'em Amare. Josh Smith threw one down with some ridiculous authority over Kendrick Perkins. The Celtics still won the game though. Remember when Grant Hill used to be able to get up like this? I think Grant Hill's Pistons' jersey was the second jersey I ever bought after my Shawn Kemp Sonics' jersey. It was the original Pistons jersey though, not the ugly mess he's rocking in the video. I purchased the domain http://yougotdunkedon.com, so you can access the blog from that address going forward. I believe the old address will redirect to the new one. If you have any issues, please let me know! Joey Graham with the sick throw down over Ryan Anderson & Josh Boone. Props to LilPharmacist11 for the vid. Kenyon Martin with the beastly two handed dunk on Rob Kurz. Carl Landry abuses rookie Anthony Randolph, Prince style. In your face Charlie Murphy! I have no idea what Brian Cardinal was thinking on this one. He deserves what he got....a posterization from Amare! I know you remember this sick dunk AI threw down on UConn while he was playing for Georgetown. This one is a classic. I used to love the old grey Georgetown uni's and still do. In honor of Lebron James' "Karl Malone Dunk" from last night, I figured this would be the perfect time to throw up a Karl Malone Dunk Mix that includes at least two dunks of Karl doing his patented hand behind the head dunk. Damn, I forgot how much of a beast the Mailman was. China and Argentina unsuccessfully join forces to try and stop this Rudy Gay dunk. Man, Joey Graham has been putting in work this season with all the dunks he has thrown down. He's definitely an underrated dunker and his latest victim is Joel Przybilla, who he posterized yesterday. Props to bigmac15. Amare Stoudemire with the big putback jam over Mehmet Okur. Yao Ming returns the favor with this dunk on Anthony Randolph. 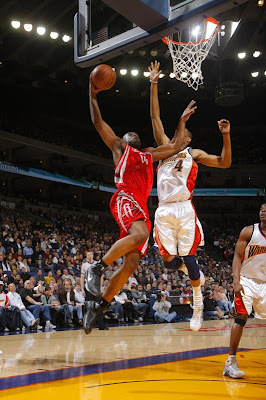 , so he decided to take it out on CDR's teammate Vince Carter. Since Devin Harris has been catching wreck this season, I thought I would throw up this older video of him throwing one down in Chris Andersen's mug. Apparently we should have known about the Dunkin' Deacons of Wake Forest, because even last season they were throwing down nasty dunks like this one. Another older dunk from Kobe, this time abusing Adonal Foyle. 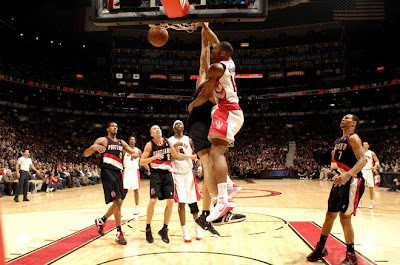 Dwyane Wade just destroyed Brandan Wright with this dunk last night. Von Wafer makes an appearance with the dunk over Chris Andersen.